This is something we are still working on. Most people are surprised that all 3 of us work part time at Outlier Cartel. The reason is simple – we want to be sustainable. Perhaps its because all of us have been around the block and we’ve seen a lot of businesses burn out fast or have to compromise for the wrong reasons. Whilst there are a number of options to for us to expand, going slowly and thoughtfully is really giving us the opportunity to maximise those outlier opportunities. We are a kiwi business with an international soul. We don’t isolate ourselves to one part of the world, and it allows us to do good in all the places we can. At all times you can. 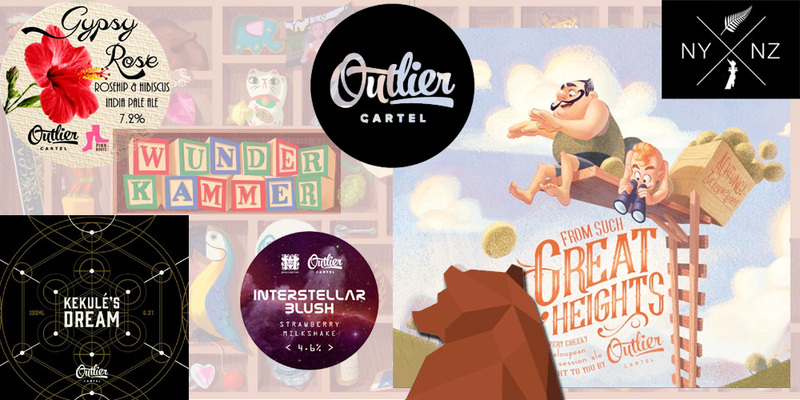 Every Outlier Cartel beverage that is drunk is a moment in time in someone’s life. We take that seriously. We make sure that our quality is the best it can be, and make amends if it is not. If we are going to be a part of that moment, then we better damn well make sure we live up to our part of it. We are all ‘citizens of the world’ defined by our experiences here in New Zealand. Everyone, regardless of nation, creed or sexual preference has the right to quality of life; and for us, it means that everyone deserves the best we have to offer. Our vision is to sustain ‘goodness’ as long as we can. In fact one of the first exercises we did as a business is come up with a 1000 year business plan. Our responsibility is to make this work, do some good and hopefully leave a legacy of goodness for others to follow. What exactly is Gypsy Brewing? What is it not? Gypsy brewing refers to the ability of brewing in different places. This means finding partner breweries willing to get your beers made and packaged at their facility, letting you set up shop where it makes sense to you for a number of different reasons. These reasons can include availability of unique ingredients, great processes at the partner brewery, water characteristics, closeness to market or a multitude of others! Gypsy Brewers can be varied, and at multiple locations at the same time. Albeit not the case for Outlier Cartel, there are cases where gypsy brewing means an actual brewery wandering to find locations that meet particular requirements or have certain characteristics that make it unique for the process of the brewery. What are some of the differences in brewing from a fixed facility and brewing as a journeyman? Are there any surprises? Having your own equipment has the enormous advantage of being able to understand and fine tune your processes to great detail. This will allow you to produce great quality beer consistently and at a better margin since you aren’t paying anyone else to make his for you. When you are a brewing journeyman you need an amount of trust in your production brewery that isn’t easy to reach. You may be able to find a partner brewery that isn’t compatible with the processes your particular brewing style/process requires. This can result in products that aren’t up to the standards you’re looking for or a product that differs from the recipe you originally designed. This only means that recipe design and executing process breweries aren’t always in unison and doesn’t necessarily reflect on the quality of the beers at a particular brewery per se. You may find that a brewery produces great quality beers under other labels, but they can’t translate your recipes accurately into the desired beers. Besides being a good brewer, what else does it take to be good at Gypsy brewing? More than being a good brewer, you need to have a good working knowledge of science, and an ability to translate product concepts to a recipe design that makes sense. It requires good process managing, understanding the logistics behind both product development and production processing. You’ll need to liaise with suppliers, source ingredients, some of which may be rare or hard to find. In addition you need to talk to local manufacturers to understand how to make things wherever you are at the moment, build relationships based on mutual trust, so you get the best and more importantly when you require it. You’ll need to be able to work across internal and external stakeholders in a timely manner and sometimes under pressure. A good brewer will be able to correctly interpret the recipe design into a physical product – so whilst not being essential to being good at gypsy brewing, the production brewer will very much appreciate if you speak their language. What are the most memorable places you’ve brewed at? Definitely brewing in Tahsis, BC as well as putting down a batch in Pearl River, NY. Being exposed to unique ingredients such as foraged mushrooms in BC as well as NY state grown malt. The unique locations and challenges/opportunities it brings with it make it a very enjoyable thing to do. Each place is unique, and this can be repeated in as many locations as you can find. 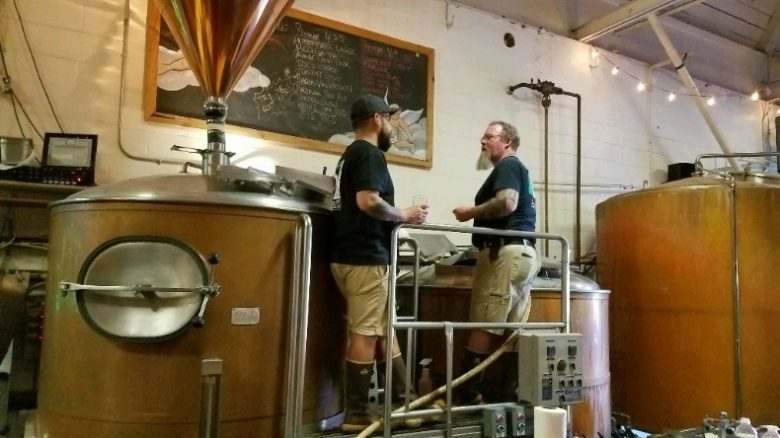 Gypsy brewers tend to do alot of collaborations. Why is this and what are our some of your favourite collaborations? See above. The ability to find locations and build partnerships often come with creating lasting relations. This uniquely human aspect of gypsy brewing will naturally result in collaborations, and it would be odd not to do this since you are partners already. Who are the most successful Gypsy brewers in the world? Locally who else is doing this in New Zealand and Asia Pacific. There’s notable early trendsetters like Evil Twin Brewing and Mikkeller of Copenhagen; and Stillwater Artisanal of Baltimore who built themselves into international brands through sales in bars, supermarkets and beer stores. They have all have been very successful and have now moved to their own facilities, some after up to 10 years of gypsy brewing. In NZ and Asia Pacific, there’s some examples like Behemoth and Yeastie Boys, as well the now defunct Cult Brewing. What are the drawbacks of being a gypsy brewer? I can name a few drawbacks from not owning your own stainless steel such as getting brewing dates bumped, not getting your carefully designed recipes translated into product correctly, getting misunderstood or poorly understood by the market – ‘wow, the quality and consistency of your beers is amazing, even though you’re a gypsy brewer’, and many others. From a business perspective, what are the main advantages of being a gypsy brewer? Here’s where the adaptability and flexibility of gypsy brewing plays in your favor: you can be at the forefront of trends by answering swiftly to even small changes since your loyal following expects precisely that from you, you don’t have a taproom that expects you to have lines with the same beers all the time, you can set up shop where you think you can sell your stuff rather than having to come up with strategies to sell stuff where everyone already knows you. Is Gypsy brewing for everyone: why or why not? Will we see more gypsy brewers in the future? We may possibly see more Gypsy Brewers in the future. Like the article mentioned above, there’s big responsibility that comes with being a gypsy brewer, and I don’t think most brewers as well as consumers actually appreciate that. You can quickly make a bad name for yourself as a brewer, because customers will expect transparency from you amongst other things. We make a point of always stating where we’ve made our beer, and are proud of our partnerships rather than trying to hide the fact we don’t own stainless steel. People will end up knowing your story, and if you’re not transparent from the get-go and good at what you do, things will eventually become hard for you. 2017: Let’s Celebrate Summer with our 2nd Birthday! Wunderkammer – It’s really a gruit, read more here! From Such Great Heights – A cheeky Canteloupean Beer! Poke the Bear – A marshmellowy summery delight! Well, Come and talk to us to find out or get in touch clicking here! 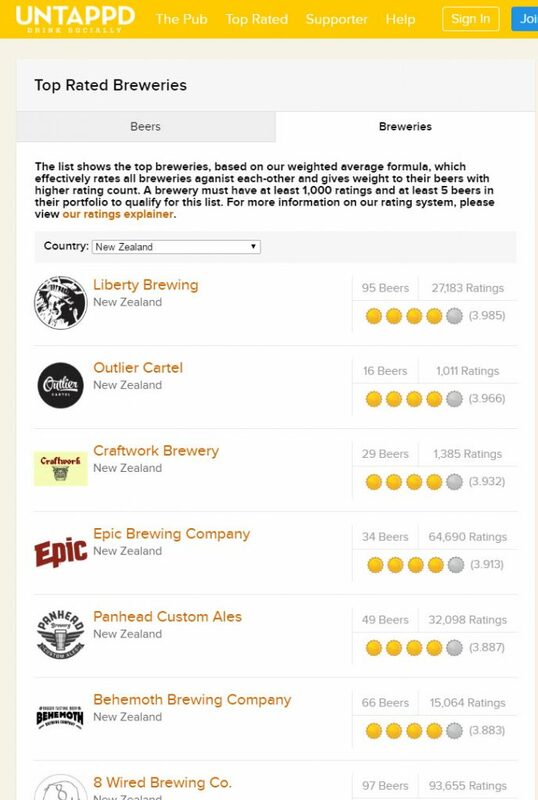 Thank you so much for your support, it truly humbles us that we got our little brewery listed in Untappd’s top rate breweries of New Zealand. There are some truly amazing breweries listed in that group, and we feel like we are lilliputians amongst giants. After a little over a year and different 16 beers, one wine and a cider, our gypsy brewing operation has been recognised by the most important people of all – those that drink our products. We can’t say that every creation is going to be a 4 or 5 star beer, the nature of our experimentation means that we’ll have a few that miss the mark. What we can say is that we are not going to rest on our laurels (if you can call them laurels at all) and we are going to keep whittling a way at what we love doing. We figure that if we pour our passion into our products, you taste that passion in every sip. So once again, a heartfelt thanks to all our friends, fans, and brewers who believe in what we are doing.